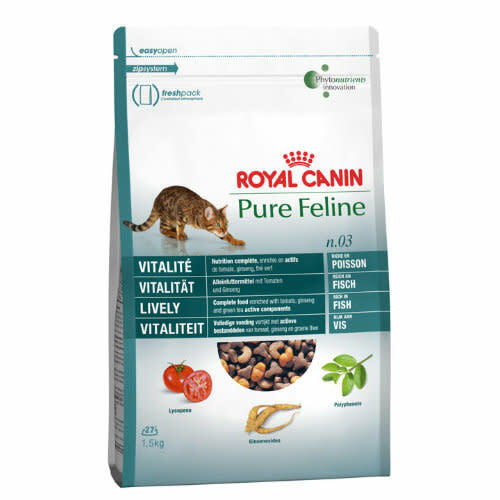 Vitality: The antioxidants (lycopene, ginsenosides, polyphenols) provided by the tomato, ginseng and green tea help fortify the cat's body. Tomato: Originating from South America, the tomato is the fruit with the highest amount of lycopene, a very powerful antioxidant. It helps slow down cell ageing, and has a positive effect to improve the barrier function of the skin and the neutralisation of free radicals. Marigold Extract: Originating from Central America, Marigold has natural antioxidant properties thanks to its lutein content, which plays an active part in preventing cell ageing. Ingredients: Dehydrated poultry meat, wheat, animal fats, maize, rice, maize gluten, dehydrated fish, hydrolysed animal proteins, wheat gluten, chicory pulp, fish oil, minerals, soya oil, dehydrated tomato (1%), marigold extract (source of lutein) (0.06%), hydrolysed crustaceans (source of glucosamine), hydrolysed cartilage (source of chondroitin). Nutritional Additives (per kg): Vitamin A: 14100 IU, Vitamin D3: 700 IU, E1 (Iron): 37 mg, E2 (Iodine): 2.9 mg, E4 (Copper): 13 mg, E5 (Manganese): 49 mg, E6 (Zinc): 162 mg, E8 (Selenium): 0.04 mg - Antioxidants (natural extracts rich in tocopherols: 120 mg).